The launch of new book Democracy Works: Rewiring Politics to Africa's Advantage. For most experts, it is a given that lack of democracy stunts economic growth. But how can sustainable democracies be ensured throughout Africa? A new book by several African authors has some useful pointers. "Democracy Works: Rewiring Politics to Africa's Advantage" was written by prominent personalities including former Nigerian president Olusegun Obasanjo and former finance minister of Zimbabwe, Tendai Biti. The authors maintain that Africa could have achieved much more economic success had more countries promoted and built strong democratic governance systems. 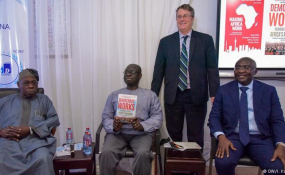 Ghana's vice-president Muhamadu Bawumia, who attended Monday's launch as a special guest, explained how the book provides lessons to enhance democracy in Africa. "Part one discusses the possible virtues of a democratic rule by reviewing cases where attention to popular preferences in the establishment of countervailing institutions have allowed for constructive economic policy development. Part two analyses the challenges to constructing African democracy in different transitional circumstances. And part three examines how elections can be made more free and fair." Bawumia then added in an aside: "I'm sure the people in Congo would like to hear more about this." Former Nigerian president Olusegun Obasanjo said the reason for writing the book was not just to find fault with current modules and governance systems in Africa but to also celebrate the continent's progress in adopting democracy. Obasanjo pointed out that only thirty years ago, free and democratic elections in Africa were seen as something of a miracle. "Whereas today, not to have election in any country will be unacceptable. So we should not underrate what we have we have achieved. I say that a disputed election result which is resolved in a court of law is better than no election at all," he told DW. According to the think-tank Afrobarometer, the number of African countries considered to be free went from two in 1980 to currently ten. 22 countries are seen as partly free and another 22 as unfree. Co-author Greg Mills of the Brenthurst Foundation in South Africa said during the launch that research confirms that "the more open the country, the more free, the better the economic performance." The record is even better, the more diversified the economies are, he added. But elections alone are not the universal panacea to societies' ills, he pointed out. Many conditions must be met for a country to be truly free, including strong democratic institutions, good governance, the fight against corruption and a strong political opposition. The former cannot exist passively for its own sake. Opposition parties "need to have their own narrative", and offer real alternatives for people to have a reason to vote for them. Mills also said that outside electoral observers needed to expand their brief. Observing the voting process itself is not enough. "Only an idiot would steal an election on election day," the researcher said. The whole process of organizing and financing elections should be observed closely to make it as transparent as possible, and the same applies to the aftermath of any poll. It is the hope of the authors and those behind the publication of the book that young Africans who represent the future of the continent will be inspired by it to become actively involved in Africa's democracy.